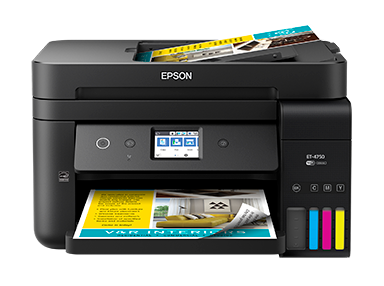 Epson ET-4750 Printer driver and utility software for Microsoft Windows and Mac OS. Epson WorkForce ET-4750 EcoTank all-in-one, provide cartridge-free printing technology with easy to refill, superb ink tanks, powered by PrecisionCore®. That’s a great amount of ink, you can print up to 11,200 pages, and equivalent to about 30 ink cartridge sets. The features of auto-stop ink bottles with each color for easy filling of each tank. You will save up to 80 percent on ink with low-cost replacement bottles. The ET-4750 also offers to you a high-capacity 250-sheet paper tray, fax, 2.4″ color touchscreen, fast auto 2-sided printing, 30-sheet ADF, and simple wired and wireless networking. It includes up to 2 years of ink in the box. This file contains everything you need to use your Epson ET-4750 wirelessly or wired. Download the Epson ET-4750 Drivers and Utilities Combo Package Installer.